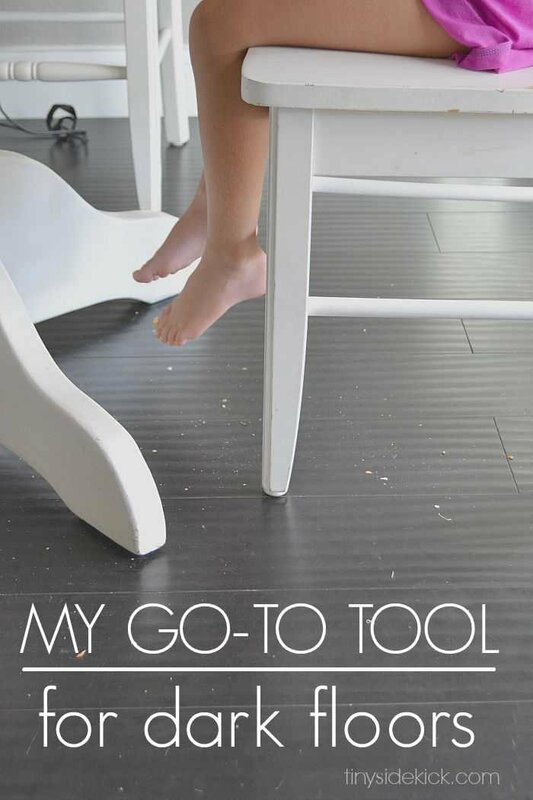 My new favorite tool for keeping dark floors clean! My new favorite tool for keeping dark floors clean! If I had to name one thing I would do differently if I ever got the chance to design my home again, it would probably be my (really) dark floors. They are so hard to keep clean and they show every. single. little, crumb. What can I say, when I chose my almost black laminate floors the only thing I was thinking about was that they looked really good, were within budget, and went with the sorta modern look I was going for. What I should have been thinking is that I was 8 months pregnant with my first kid and that kid, and her eventual younger brother were going to be really messy (although totally lovable) little things that would have me sweeping as an almost full time gig. a gool ol’ fashion broom which pushed the dust back up into the air only to land on the floor again. Swiffer dry cloths, which I stuck with for a long time but they did’t get the actual dust very well. Swiffer wet cloths, which were too expensive and I had to go through about 3 of them to get my kitchen mopped. The Roomba. Silly thing got lost too much. My dog who did a stellar job, but she moved on in January bless her heart. And my vacuum, which was never really great to begin with, and recently died. So I was on the hunt for a new solution when the stars aligned and I got an email from the lovely people at Dyson. They wanted to send me their new Dyson V6 Absolute vacuum to see what I thought about it, so of course I said yes! Can I just tell you how great this thing is? First of all it is cordless, which is awesome. So easy to get out really quick for those quick after meal clean ups and it picks up all of the crumbs, dust, hair, and even rice. God I hate wiping up rice off of the floor. Then when you are done, you just put it back on its holder and plug it in till next time you need it. It’s definitely making my morning spruce up routine easier. 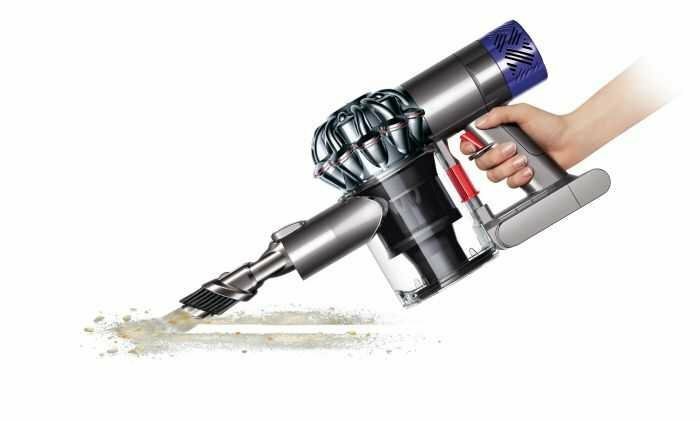 Before I even had a chance to blow steam out my ears, I grabbed the Dyson V6 Absolute and quickly switched out the parts to make it a hand held vacuum and it sucked up every little last bit of sand. Crisis averted! 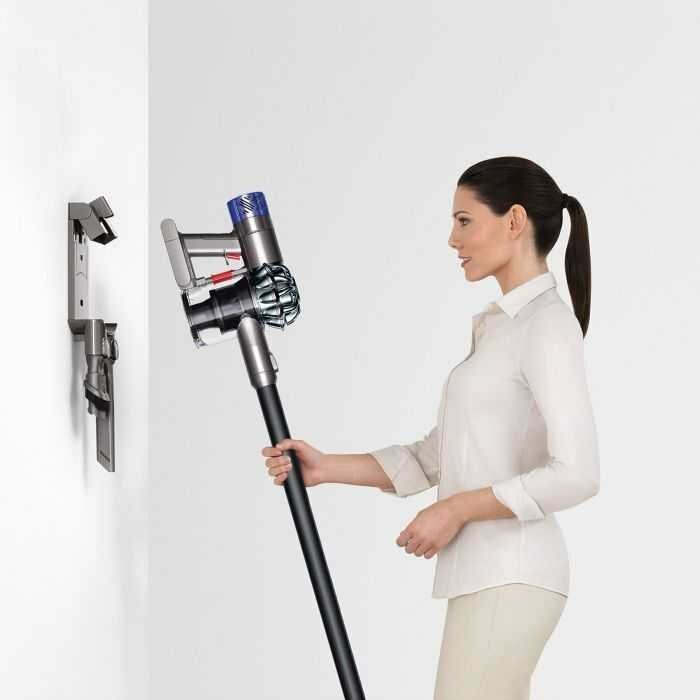 You can find the Dyson V6 Absolute right here on Amazon. A big THANK YOU to Dyson for gifting me this awesome vacuum to review. This post contains affiliate links which means that at no additional cost to you, if you make a purchase through my link, I may receive a small commission. Thanks for supporting TinySidekick 🙂 You can see my full disclosure here. I love your dark floors. What brand and color are they? Hi Laura. Great question. I’m able to vacuum the entire downstairs about 1200 square fee about 2-3 times on one charge so it lasts pretty long. I love this thing! I love this vacuum! I got one for my dad, he had been using the same old bulky vacuum for years. With him walking with a cane this vacuum was a life saver for him. In reading your story I thought, this is my same exact sentiment. I too would never ever purchase dark floors again ! When I was picking them out I thought they were fabulous, until it was time to keep them clean on a daily basis. At this point I know why they were covered up in many older homes, they didn’t want to spend all day concentrating on keeping their wood floors spotless. I totally get it. My question is how can I get a DYSON V6 ? I’d be more than happy to share my my experience with my unhappy floors. I have owned two of these in the last 3 years. One at my cottage and one at home. I love them. Any one at the cottage just picks them up and cleans , they all love them also. It has definitely been a life saver. I love how light weight it is too!